Movement of the ground causes the casing to deform. Eventually, the casing is sheared off or pinched closed. 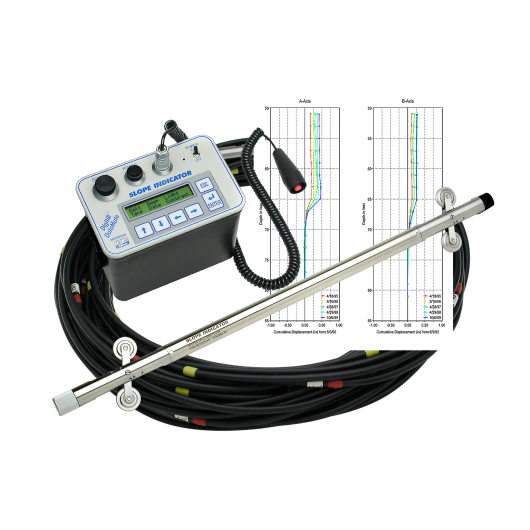 When that happens, the probe can no longer pass through, and no more readings can be obtained. In general, larger diameter casing will offer a longer useful life, because it can accommodate more deformation before access is closed to the probe. 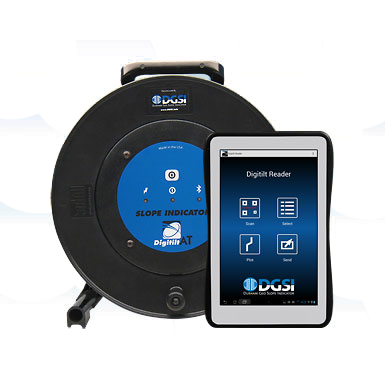 QC casing is Slope Indicator's most popular style of casing. It offers precision grooves, flush self-sealing, joints, and snap-together convenience. Casing sections have built-in couplings that snap together. O-rings ensure that the joint is grout proof. There is no need for solvent cement or tape. QC casing is offered in 70 and 85 mm diameters. 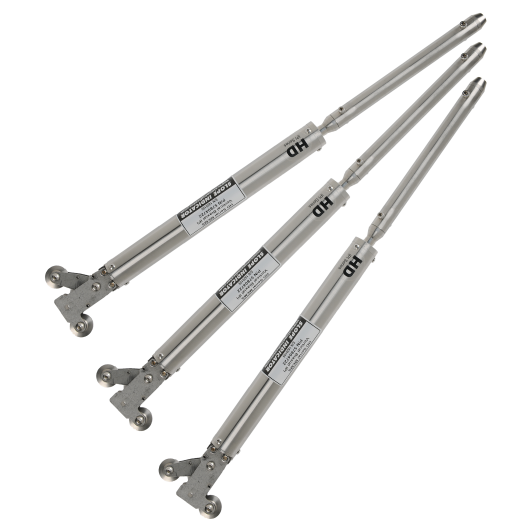 Accessories include grout valves, casing anchors, telescoping sections, and splice kits. 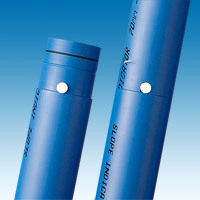 This is Slope Indicator's traditional glue and rivet style of casing. It features precision grooves and strong, flush joints that provide superior resistance to twisting and bending. Casing sections and couplings are glued together, riveted, and sealed with mastic and tape. 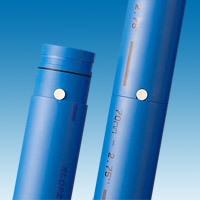 Standard casing is offered in 48, 70, and 85 mm diameters. 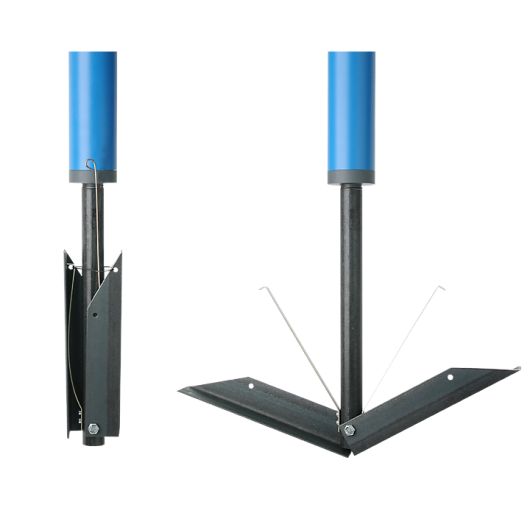 Accessories include grout valves, casing anchors, and telescoping sections. Epic casing is an economical casing that withstands rough handling. It can be cut and coupled anywhere along its length, so it is easy to extend and easy to repair. Its strong, oversize couplings provide superior resistance to twisting and bending. Casing sections and couplings are glued together, riveted, and sealed with mastic and tape. The injection molded couplings provide an interference fit for better sealing. Epic casing is offered only in 70 mm diameter. Accessories include grout valves, casing anchors, and simple telescoping couplings. CPI casing features precision grooves, self-sealing couplings, and rapid assembly. Its oversize, injection-molded couplings can withstand twisting and bending. 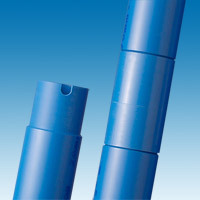 CPI casing can be used in weather that is too cold for snap or glued couplings. 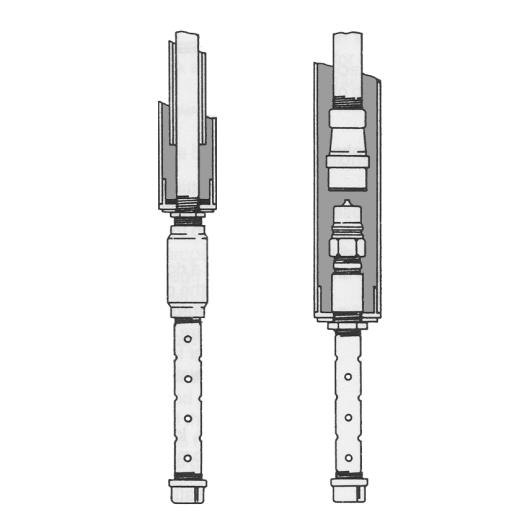 It is also suitable for temporary installations that require repeated assembly and disassembly. The coupling is pressed onto the casing section and an nylon shear wire is inserted to lock the joint. An O-ring inside the coupling makes the joint grout proof. 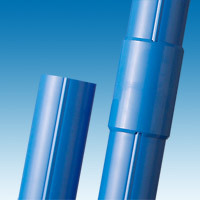 CPI casing is offered in 48, 70, and 85 mm diameters. Accessories include grout valves, casing anchors, and telescoping sections. Shear wire casing is a cold-weather alternative to QC casing. 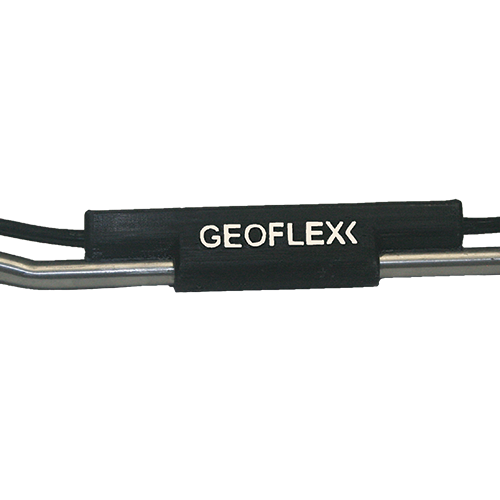 It provides precision grooves, self-sealing flush joints, and rapid assembly. Shear wire casing can be disassembled, but it is not designed for repeated disassembly. Casing sections have integral couplings. Sections are pressed together and a nylon shear wire is inserted to lock the joint. An O-ring makes the joint grout proof. Shear wire casing is offered in 70 and 85 mm diameters. When grout backfill is still a fluid, it exerts an uplift force that can force even water-filled casing out of the borehole. The obvious way to counter this buoyancy - holding the casing down from the top - has some unfortunate side-effects. Held down from the top, the casing goes into compression and snakes from side to side in the borehole. Thus casing curvature is present from the start, and slight changes or errors in the positioning of the probe will produce reading errors - the larger the curvature, the larger the error. The best way to counter buoyancy is to anchor the casing at the bottom, either by weighting it or by using a convenient casing anchor. When the bottom is anchored, the rest of the casing self-centers in the borehole and becomes very straight. The casing anchor shown here has spring loaded arms that are activated when a pin is pulled. The leaf spring in the casing anchor will expand the anchor approximately 10 inches (25cm) from tip to tip. 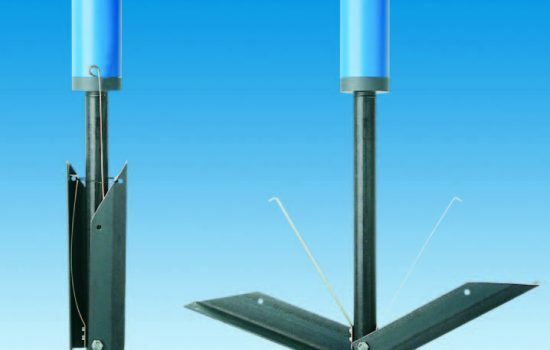 Therefore, the casing anchor should only be utilized in boreholes that have a diameter of less than 10 inches (25cm). Once the anchor catches the side of the borehole, the anchor will continue to expand such that the distance from tip to tip is 19.5 inches (50cm). This final expansion will allow the casing to travel upwards up to 4.5 inches (11.5cm), assuming no deformation of the in-situ soils. Casing anchors are available for 70 mm • 2.75" and 85 mm • 3.34" casing sizes. Combination anchors + grout valves are also available. A grout valve provides a way to deliver grout backfill when there is no room in the borehole for an external grout pipe. 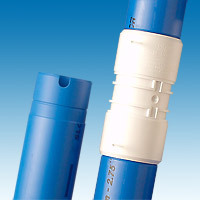 The grout valve is a one-way valve installed in the bottom of the casing. After the casing is in place, a grout pipe is lowered through the casing to mate with the valve and deliver the grout. The gasket-type grout valve is shown at right. You can see the gasket at the base of a smaller diameter pipe. 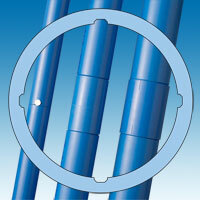 A larger diameter grout pipe slides over the smaller pipe to rest on the gasket. Grout can then be pumped through the valve. When grouting is finished, the remaining grout in the pipe is flushed with water (just enough to displace the grout in the pipe) and then withdrawn from the casing. Grout valves are easy to use, but require a slightly deeper borehole. Also grout must be mixed carefully so that it does not have lumps that could be caught in the valve mechanism. The grout pipe is nominal 1.25" pipe. 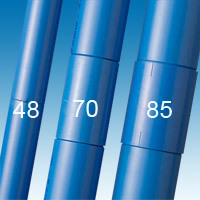 A 1.25" schedule 40 pipe has an ID of 1.35" (35mm). The smaller diameter pipe, which is part of the grout valve, is 3/4" pipe. It has an OD of 1.07" (27 mm). Mix cement with water first. Then mix in the bentonite. Adjust the amount of bentonite to produce a grout with the consistency of heavy cream. If the grout is too thin, the solids and the water will separate. If the grout is too thick, it will be difficult to pump. The 28 day compressive strength of this mix is about 100 psi, similar to hard clay. The modulus is 10,000 psi. Mix cement with water first. Then mix in the bentonite. Adjust the amount of bentonite to produce a grout with the consistency of heavy cream. If the grout is too thin, the solids and the water will separate. If the grout is too thick, it will be difficult to pump. The 28 day compressive strength is about 4 psi, similar to very soft clay. It is not really practical to try to match the strength of the grout to the strength of the soil, since the properties of grout and soil are so different. The cement-water ratio controls the strength of the grout. To decrease the strength of the grout, add more water. The density of water-filled casing is about 62.4 pounds per cubic foot or 1000 kg per cubic meter. The density of ABS casing and the density of water are nearly the same. The density of bentonite-cement grout is about 80 pounds per cubic foot or 1280 kg per cubic meter. The area of the bottom cap of 2.75" (70mm) inclinometer casing is 0.0412 square feet or 3.8485E-3 square meters. Thus if the bottom cap is 100 feet deep, the uplift pressure on the 2.75 inch bottom cap will be about 72.5 pounds or 32.3 kg. 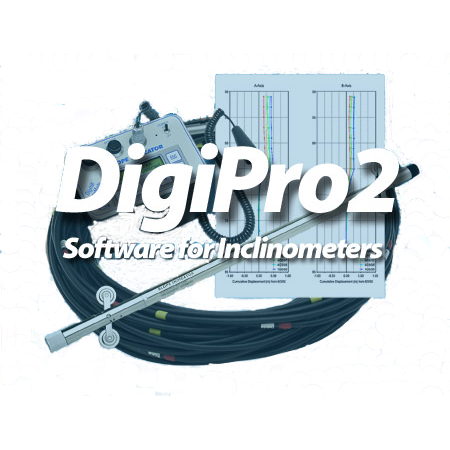 Please download the data sheet for Inclinometer Casing. QC CASING 85MM · 3.34"
QC CASING 70mm · 2.75"
STANDARD CASING 85mm · 3.34"
STANDARD CASING 70mm · 2.75"
EPIC CASING 70mm · 2.75"
CPI CASING 85mm · 3.34"
CPI CASING 70mm · 2.75"
CPI CASING 48mm · 1.9"
SHEAR WIRE CASING 85mm · 3.34"
SHEAR WIRE CASING 70mm · 2.75"